Always challenged and adapting in a changing real estate market Dayle recently expanded her business by investing in the growing Thames Coromandel Peninsula and shares in Harcourts Coromandel Beaches Realty Ltd. Her long term partner Dave joined the business along with Carolynn LeMac. Together they service long term clients in both Auckland and are growing their client base in Whitianga and Coromandel, a location where many are rapidly investing and is enjoying tremendous growth and opportunity. The Coromandel was for many years the holiday paradise for her growing family, a desire to enjoy and improve both environments has truly energised the couple. 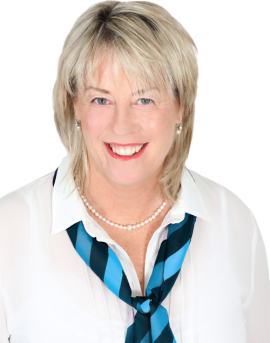 Dayle brings to Real Estate a refreshing passion for life & work. Clients appreciate her tenacious personality and diligence. It is this drive to help clients succeed in their pursuit of a sale that makes Dayle such a good agent. She is an experienced, trustworthy problem solver, and with a loyal customer base, comes highly recommended. She has developed a well-earned reputation for honesty – blended with humour & outstanding service. 26 years with the NZ Police and 9 years running a well-known children’s education toy shop are strong testament of her desire to serve the local community well. A family woman, raising 4 children, and a North Shore resident, she has a great knowledge and a passion for the North Shore instilling confidence. In supporting her community sporting passion, she is an active sponsor of North Shore and Belmont Park Squash. Her friends, family & client base enjoy her natural aptitude for working with people, and her business acumen. Results are important to her. Making the decision to entrust Dayle with your real estate needs is one you will be pleased you made.